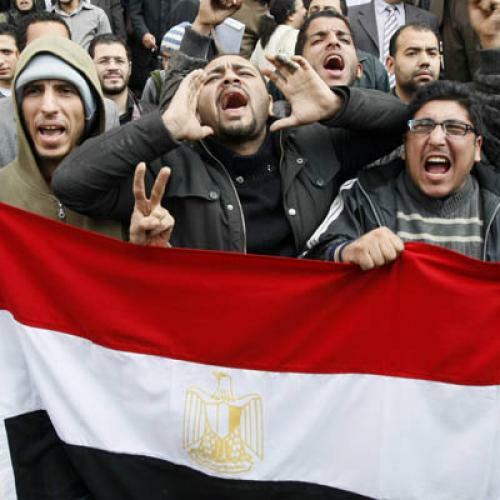 The first round of Egyptian protests was liberal. The second will be Islamist. Cairo—Downtown Cairo is one of the loudest places in the world, but tonight it is eerily quiet. There is an unusual amount of elbow room—make that enough room to extend one’s arms fully—in Tahrir Square, the heart of the city which many thousands of demonstrators descended on last Tuesday. The steps of the Journalists Syndicate, a key locus of protest that was packed only yesterday, are completely empty. The Lawyers Syndicate is hosting a demonstration for the third straight day, but it is noticeably smaller, and relatively few people beyond the participants and the riot police seem to be paying attention. Indeed, after losing round one of these anti-authoritarian demonstrations when protesters stormed Tahrir Square, the security forces have won round two decisively. Hundreds, at least, have been arrested; thousands have been tear-gassed; and millions have watched their city fall under a police occupation. But round three begins tomorrow, when the opposition activists have called on worshippers to commence demonstrations immediately following Friday prayers. It promises to be the ugliest and most violent episode of this tumultuous week. That’s because, after three days of demonstrations that have been dominated by pro-democratic youth activists, these post-prayer protests promise a greater voice for Islamists. And as harshly as the regime deals with its liberal opponents, it deals with Islamists—and particularly the Muslim Brotherhood—far more brutally. The regime views Islamists, correctly, as its foremost domestic challenge: Islamists provide a coherent, if uncompromising, ideology that contrasts sharply with the regime’s non-ideological demeanor, and they have further recruited millions of followers through intensive interpersonal networking and the provision of social services. Whatever happens, the linkage of prayer and protest—and the fact that the protests will originate from such a wide variety of locations—promises to make this the most consequential day of the current standoff. And if the regime prevents people from praying or interferes too overtly in their day of worship, the gloves will surely be off. If Cairo is quiet tonight, it is likely a misleading calm before the storm. Eric Trager is a Ph.D. candidate at the University of Pennsylvania. He was a Fulbright fellow in Egypt from 2006-2007.